Many pro-am collaboration seem possibles. The subject is therefore important for the amateurs of spectrography, besides the fascinating fact that it is possible to observe the activity in the stars atmosphere! I propose reflexion concerning coordination of these observations (data base, campaign...) and I can try establish professional contacts. I encourage you to observe, contact me and publish on this forum or elsewhere your first results for a better demonstration. Pour le LhiresIII comment peut on calibrer si j'utilise une Atik 314, j'ai une plage de ~100A, les raies H&K rentreront mais je ne vois pas comment les calibrer précisément, quelle lampe utiliser ? - Certaines lampes comme des lampes au Mercure, Xenon ou Krypton peuvent avoir des raies intéressantes dans cette région. Je suis en train d'en tester quelques une. Etienne, je suis tout à fait d'accord avec ce qu'indique Olivier. Une bonne étoile un peu brillante de type A fourni toutes les raies nécessaires (fin de la série de Balmer) pour réaliser une une focalisation de qualité. L'usage d'une lampe fluo-compact, avec notamment une raie du mercure à 4047 A peut être une aide aussi, au moins pour ce repérer. Nice (and perhaps longterm) program Christian, once there is a public database to see it online which star deserves coverage at the given moment - I'd certainly shoot 1-2 of such targets occasionally (including other target types). I'd also suggest having a reference target to occasionally check and demonstrate, that our practice is stable and data in the database is reliable or how much is the error with various instruments - from a given measurement perspective. - Ar/Ne internal lamp (a bit inaccurate at edges of my ATIK 428 EXm), doing at least 20 sec (before and after exposure). Note that I wrapped the bulb in plastic (other might not work ). - BLB (Black Light Bulb) type of lamp as flat (plastic diffuser), removing a few emissions in 1D (and applying that correction in 1D, instead a regular flat). Both internal and external usual Halogen lamp causing severe reflections on the ccd with my LHires III, found BLB much better by practice (and suddely noticed ripples on my ATiK 414 EXm - till that point I thought Halogen was OK). 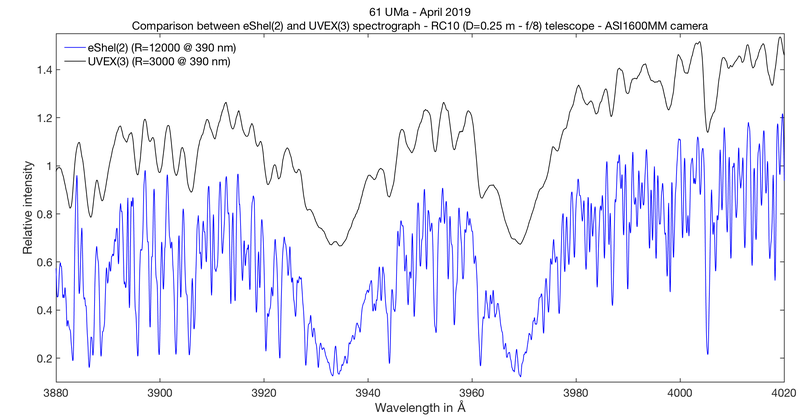 Though, the 414 does not suffer the roughtly 50A sinusoid (low res) ripple, that is an important artifact with the ATIK 428 (probably the ATIK 460 too). Other practice can be, to use a known standard spectrum like Vega, treating continuum with a careful filtration. I also found the 35 micros slit to be more acceptable with the chromatism error (resolution variation) than the 23 micron. I am measuring the R~5000-5500 with 2400/mm grating via the internal cal. lamp, that may represent a lower f-ratio than the incoming beam (f/10 in my case). During vacation + 2 clear skies, I've made further experimental progress on this area. On 04.15, I've been shooting repeats of stars Christian mentioned, attaching as a zip (so everyone can compare). No heliocentric correction made. As one can see, H7 and H8 peaks also present. Continuum available reliably only towards 4000A. In case of BF Lyn, H & K emission cores are well separable (depending on period), coming from the binary components. H7 or other emission also present (requires deblend procedure to measure). I have started a process getting through a 1st validation at aavso (unsure when to happen - and what else required), so pls take all of these quick results as preliminary / demonstrative. I was using ref.star from Pickles (order 3 polynom everywhere), using BLB flat in 1D (removing few emissions), doing Ar/Ne lamp. Made no heliocentric correction in these examples. EW is always resolution independant. Montes's acted that reconstruction and susbtraction methods have similar results for EW measurments. Just in order to clarify the bib ref you gave. Thank you Benji for the reference correction and the look! You are true, this document is comparing 2 techniques. However, in 2.3 it is clearly stated that " The spectral subtraction technique provides better results when..." - something that applies for BF Lyn - e.g. multiple lines to deblend require precise continuum, and the widened absorptions (high rotation) require careful treatment. Moreover, the measurement difference is multiplied when the EWs are bigger (Fig.1) - and to my practice, what I see on that graph, that difference is quite relevant. Although the EW is resolution independent, the measurement trivially isn't - there are errors that must be analysed and treated, e.g. seriewise correction to fit the lower to the higher resolutions serie, or injecting assumptions about continuum or other accidentally included features - e.g. here: H-epsilon - and test the injected theory. I suspect such a subtle measurement technique (across many resolutions) will be even star-dependent. EW measurements are only resolution independent in the absence of blending. If a line is fully resolved at one resolution it will not have the same EW at aresolution where it is blended with one or more additional lines.. 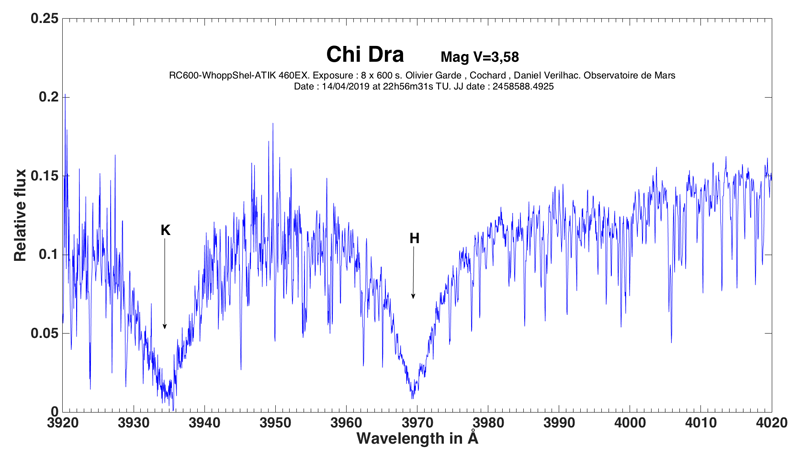 Here is a spectrum of Chi Dra taken with a prototype Echelle spectro with a resolution of R = 30000.